Rodney Balent has taken to Kickstarter this week to launch his new Raspberry Pi ATX Power Board which provides a great addition to the Raspberry Pi mini PC and is capable of controlling 16 relays. 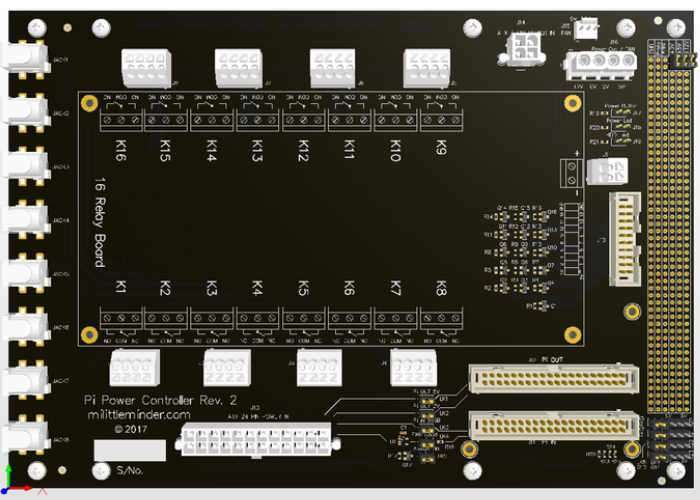 The Pi ATX Power Board is capable of supplying 12 V to 16 DC jacks all powered from an ATX power supply and is equipped with on-board sensor support. Watch the demonstration video below to learn more about the new Raspberry Pi ATX Power Board. Raspberry Pi ATX Power Board is available to back via Kickstarter with pledges available from AU$120 and shipping expected to take place during October 2017. Rodney explains more about the inspiration behind the new Raspberry Pi power board and its design. I started out with the simple goal of wanting to automate a few things around the home starting with my vertical garden using a Raspberry Pi. With that goal in mind I decided to make a 16 bay relay board so I could control as many devices as possible from a single point. It was then I found how much space this would take up, and how long it would take to wire up and it became impractical. So the next logical step was to look into making my own PCB. I noticed that virtually all the devices I wanted to control ran on 12V, I also noticed how many spare ATX power supplies I had lying around and the gears in my head started turning. Why not combine an ATX power supply and a Raspberry Pi? So the Pi Power Board was born !! It has 12V DC jacks on one side, an “off the shelf” 16 Channel relay in the middle, and an ATX power supply up the front powering the lot. As time went on I developed more and more features and decided the best place for all this to live would be in a standard PC case, so I made it mountable. I have spent the past few months growing the idea and features and now have a full circuit diagram and board layout fully designed by a professional PCB creator. The challenge now is that I need to pay for the PCB services, such as time for PCB designer and my first prototype and board batch run. I am now looking for anyone who would like to share in this by assisting with funding and would welcome any feedback, especially from people with more experience than me. So how far am I along? The circuit diagram and PCB board are complete. Shortly I will be ordering my first prototype and will begin testing. I am almost there but need little help getting it to completion. The cost of the prototype and first few boards are going to stretch my finances too far, but with your help we will get this into our homes soon. For more information on the new Raspberry Pi ATX Power Board jump over to the Kickstarter website for details by following the link below.